My name is Leah. The usuals: I was born and raised in Minnesota, USA, but live in Germany now; I’m 26 years old; I LOVE to travel, and I wish I was still actively playing hockey and softball! How did I get to Germany? I studied abroad when I was in college and ended up meeting a super amazing German guy. We hit if off, did over a year of long distance, and I moved to Germany to be an Au Pair. We ended up getting married after and I stayed in Germany and here I am. I was diagnosed at the age of 14, so I’ve had T1D for 11.5 years. I always have to rewrite that last sentence, I am T1D or I have T1D. The biggest dilema. What eating regime have you found to be most helpful in managing blood sugars? What hasn’t worked? The last three months I have been eating low carb, high protein LCHP, Dr. Bernstein style of 30g carbs or less per day. I find that when I eat LCHP, my blood sugars are predictable and steady. I do not see big swings in blood sugar because I don’t consume very many carbs. It’s the law of small numbers: fewer carbs, less insulin, less blood sugar fluctuation. I’m really passionate about the LCHP lifestyle. I don’t mean I don’t get to eat delicious things. There are LC alternatives to literally anything you can imagine! Prior to that, I was on a path of self-destruction. I was eating whatever I wanted and just taking insulin, you know like they told me I could do. But my blood sugars were incredibly unpredictable and the ups and downs made me feel horrible. I was moody, angry, and was so upset that I couldn’t just get it right. I was always told that I can eat anything, but the results speak for themselves. Of course, I can eat anything, but I will pay a price. I suppose all of our prices are different. What type insulin do you use and what insulin dosage method works best for you and your lifestyle? How do you treat a low blood sugar? Glucose only. I recently found chocolate flavored glucose tabs, and it has changed my life. But really, I only use glucose tabs. They work the fastest. Also, it is a slippery slope to bad habits, an unhealthy food relationship, and overeating if I choose to “treat” myself while low. Do you exercise? What do you like to do for exercise? How do you handle activity with controlling your blood sugar? I ride my bike to work nearly every day, weather permitting. So I get 7km in each way, a total of 40+ minutes. Morning blood sugars behave nicely while riding bike. I don’t eat breakfast before, so I have no active insulin. However, afternoons are another story. I need to eat a few gummy bears, 8g carbs, before I leave so that my blood sugar doesn’t drop. Lunchtime active insulin will drop me if I don’t. Thankfully this works really well for me. I do not see a spike or drop when I use this method. But it was all about trial and error for me. It took me months to find this sweet spot. Other than riding bike, I do wish I would run more. What tips would you rattle off for someone who is trying to improve their blood sugar control? Or even for someone who is newly diagnosed with type 1 diabetes? Eat fewer carbs. Period. To be honest, I am quite angry I wasn’t told this before. It’s common sense. Why consume the one thing that our bodies are incapable of breaking down? Also, my second favorite Dr. Bernstein quote is this, “there are essential amino acids and essential fatty acids, but there is no such thing as an essential carbohydrate”. What does a typical day of food look like to you? Breakfast: coffee with heavy cream, if it’s the weekend: eggs, LC pancakes, LC biscuits, bacon, etc. Lunch and Dinner are usually very similar. I eat a lot of cauliflower, broccoli, radishes, brussels sprouts, chicken, beef, turkey, avocado, etc. and in all variations. There are SO many low carb recipes and alternatives out there. I would encourage everyone to google their favorite meal, plus low carb. There WILL be an alternative and it WILL be delicious. What is the hardest part of being diabetic? What is the best part? For me, the hardest part is not seeing the results of the hard work that has been put into managing the disease. Sometimes things just don’t work the way the should, but that never means giving up. And I suppose the best part is that I will always know the impact of the food I am putting in my body. That is a beautiful thing. To anyone who thinks eating low carb means giving up favorite foods, don’t think that! The beginning is not always easy when adjusting to this LIFESTYLE, but it is worth it. I’ve had a few setbacks along the way, but each day when my blood sugar line gets flatter, I know I am doing the best thing for my health. That’s invigorating. And I encourage all of you to explore and find that flat line. As a type 1 diabetic, I think of myself as a walking, human pancreas. The role is no joke, but one I can’t disown. Every time I eat, as do my fellow type 1 diabadasses, we need to review, assess and time what foods, in what quantity we want to eat, without rocking our blood sugars. It has gotten easier with time, but when eating foods we don’t prepare, it can be more challenging. I choose a meal that includes what I call PFF: 1) animal/egg/fish protein, 2) fat, including olive oil. butter, avocado, nuts or a bundle this with choosing a fattier protein source, and 3) a food high in fiber, including vegetables, beans, lentils. When ordering drinks, I politely and try to casually mention to the waiter/waitress I need a gluten-free meal. About 1 in 100 people have celiac disease, but about 10% of people with type 1 diabetes also have celiac disease, according to the American Diabetes Association (ADA). This doesn’t include the high number of gluten sensitivity. Adjust your order to your needs. I will see something on the menu I like, for example, a grilled salmon, and I will adjust what comes with it to make it lower carb. Often salmon will come with potatoes of some sort, and I will ask for broccoli instead. Know that most restaurant meals add salt, sugar and extra oils to a dish to make it taste better. This results in eating more and needing more insulin. Just being educated on this, I focus on eating just enough and taking a larger dose of insulin for the dish. If ordering a salad, opt for olive oil and vinegar. Canola oil or vegetable-based oils are often the standard for many restaurant dressings and these fats are harmful to our health. As well, dressing can often have a lot of hidden sugar. Review a menu before you go and ask questions to understand how much sugar/carb is in the meal you want so you can calculate your needs. Also, don’t be afraid to ask your server if an entree can be baked, grilled, or broiled instead of fried. Don’t deny yourself, but also don’t overeat. Keep it simple and be present and mindful. If you are on an insulin pump – use the “Dual/Square or Extend” bolus options so you don’t take your insulin too late, nor bottom out before your meal arrives. While sitting and talking with company, drink plenty of water and try avoiding alcohol while you eat. Make it the appetizer or dessert if you wish to drink. For dessert – ask if you can have fresh berries and cream instead of the other dense options. Seriously, in the world of Amazon Prime, we can surely find a way to make dinner healthier, easier, and faster. Maybe we just use Amazon Prime 🙂 So let me just get right to it. Here are some of my kitchen hacks on how to build an easier dish and simpler solutions for mealtime. If you plan to have a daily salad, make a large one and store it in the salad spinner. It will last longer, and usually, when you open the fridge it will be at eye level, which will also influence you to eat/want more of it. To whip together a diverse salad without chopping a lot of things, combine coleslaw vegetables with lettuce greens. Come mealtime, top this with high-quality protein (wild, canned seafood or pre-grilled meat) and nuts, and you are good to go. Portable packets of extra virgin olive oil are clutch, along with lemon packets. This serves as a simple, portion-controlled dressing. Portable fruit is a great way to round out a salad-based meal. Don’t fear carbs. Whatever you store the salad in, put a paper towel in with it. It will extend the life of the leafy greens. If I have 1 limp salad, my desire for salad over the next few days…are limp. Buy pre-washed and pre-cut vegetables/fruit. Have you seen the awesome cauliflower rice from Trader Joe’s and Costco? Or the frozen zoodles from Trader Joe’s? Easy peasy. You can microwave both of these. Top with some olive oil or butter, salt, and pepper. Nom nom. Canned organic beans. So versatile. Open a can and rinse the beans and toss them in a skillet with a little avocado oil, salt, and pepper. Stir for 5-10 minutes, depending on the texture you prefer. Sometimes, I just want them warm. Overall beans are a great slow-cooker or vegetable addition. Have you made chili yet this Fall? It’s a 5-minute prep process! Pull a pound of ground meat out of your freezer, organic beans, organic diced tomatoes and a pre-mixed spice packet (you can make your own combination, but we are talking easy here). Toss all the above in the slow-cooker and let cook for 6 hours on high and you are good to go. I love my chili with a dollop of guacamole (Costco has a great pre-packaged one. I do not like the 100 cal packs of guacamole as they taste off). Roast veggies (3 sheets of veggies at a time. Make true use of the time you are using the oven. I often roast chopped Brussel sprouts, frozen veggies and some form of potatoes). Fruit or sliced veggies with nut butter packets (like these). I make a box of lentil-based pasta every week (I get my pasta from Trader Joe’s or Thrive Market). I drizzle olive oil on it after cooking to prevent leftovers from clumping together. This is a handy and satisfying side to mix with most things. Slow-cooker: Perhaps I should have put the chili comments down here, but REALLY, befriend a slow-cooker and/or an Instapot. The saved time will be worth your money. Shoot, you can even use Kohl’s cash on these kitchen tools. Tis the season. I work from my freezer (A LOT) and my family really enjoys when I do slow-cooker tacos/Mexican. I pull out a bag of frozen diced peppers and onions (Trader Joe’s), a pound of ground meat and spices. Sometimes, I will get a little frisky and add in some salsa. If I don’t do the salsa, I just add a little broth. Thanks to Costco for conveniently offering bone broth at an awesome price, I often have a carton opened in my fridge at all times. The broth is great for bumping up the nutrition of a meal and reducing the need for adding fat to saturate ingredients. Chicken Artichoke (hello fiber) Stew: I get the frozen artichoke from Trader Joe’s, I use 2-3 chicken breast, enough broth to just cover, a carton of sliced mushrooms and enough peas to add good color. Salt and pepper to taste, cook on high for 6 hours. This is awesome when paired with some cauli-mash. Meal prep paleo pancakes. Pancakes were my go-to before I knew I was sensitive to eggs (KBMO Fit Test). Overall they are healthy, filling, high in protein and good fat and easy to take when wrapped in foil. I like the recipe of just mixing a small banana with 3 eggs – or – adding 1 scoop of protein powder (like my favorite one from Standard Process) + 2-3 eggs. Mix the 2 ingredients together until you get a batter-like consistency and make 1-2 pancakes out of it. Overnight oats (gluten free) with collagen protein powder and some nuts/chia seeds in mason jars. Combine smoothie ingredients in a blender, the night before, and store in the fridge. Come morning, you can blend and go. Chicken sausages – and I am picturing the various flavors from AmyLu. Throw 2 of these in the microwave or skillet, slice and have with some fermented saurkraut. Pair with some leftover roasted veg or gluten-free grain like wild rice. Dinner: always double recipes and use leftovers for following lunches and dinners. Regardless of what you put together – keep the ingredients simple. Breakfast for dinner! Pleases everyone. Buy an organic rotisserie chicken from Whole Foods (or from somewhere like Boston Market, but when the quality of the chicken is lower, avoid eating the skin) and have it with a salad kit or leftovers. Cook fish from frozen. My fam loves the salmon burgers from Costco. Heat oven to 400F, cook for 12-20 minutes depending on the thickness of the fish. Have a smoothie for dinner. Mix frozen greens, vegetables, ice/water, spices (cinnamon, ginger, or cocoa) with some frozen fruit, high-quality protein powder. I always top my smoothies with something crunchy to help enjoy “eating” my meal. I like baked coconut flakes, sunflower seeds or cocoa nibs. Be organized – have the right tools in your kitchen: a good knife, cutting boards, blender, food processor, slow-cooker, ceramic skillet, and a white/board. The whiteboard or menu board can help make the meal ideas easy – and assist in building a grocery list. Try to only grocery shopping 1-2x a week to save time, and download an app like AnyList to have a handy list at all times. Pack your lunch – and be sure to have good containers, thermos, shaker bottles, water bottles and lunch boxes. I have way too many water bottles and bento boxes, but you know what? I am always hydrated and have a packed meal when need be. Buy as many things you can online. I use Amazon Prime (also for Whole Foods produce) and Thrive Market. What tips and tricks do you use/do? I want to hear, selfishly to make the mealtime even easier! This past weekend wasn’t only Mother’s Day, but it was also National Apple Pie Day. On this very day, May 13th, I had the pleasure of demonstrating an allergen-friendly recipe on the local Columbus, OH 10TV News. 1. Mix sugar and cinnamon together in a large bowl. Peel, core, and slice apples, and place in a Wholly Wholesome Gluten Free Pie Shell. The apples will be piled high but will cook down in the oven. Sprinkle sugar/cinnamon mixture over apples. 2. Spoon coconut oil and place on top of apples. Add second pie shell over apples and crimp pie edges. Poke a hole in top crust to allow air to escape during baking. Place pie on a sheet pan and bake in a preheated oven at 375° for 30 minutes or until top is browned. You will know the pie is done when a paring knife can be easily inserted into the center and the apples are tender. I cried last night (when I learned the news of MTM). Numerous times actually. Never before have I been so taken back when an icon and public name had passed. Mary Tyler Moore was and is different. She was dynamite; she was a force to be reckoned with and a voice for raising money and awareness for type 1 diabetes. She was beautiful inside and out, and I am not the only one saying this. She made an impression on millions, including Oprah. With Mary’s passing I am reminded what it means to have diabetes. Pain does nourish courage, and every day we are brave to carry on what we do. Those of us with diabetes wear many hats. We are consumers, scientist, nutritionist and humans wrapped into one. Yes, there are some scare tactics with this disease, but on the flip side, diabetes is a reminder to embrace my body and health. I am constantly consciously and subconsciously asking myself how I feel and if I need to take action to improve my blood sugar. Diabetes is a daily reminder to live in the moment and to make the day count. I am alive, and thriving after 25 years of being diagnosed with diabetes. This is a miracle compared to those diagnosed before insulin was discovered, let alone made in a lab. I have children. When I was diagnosed on my eighth birthday, I always toyed with the idea that I would have to adopt to have kids. I am so in love with my profession, as a dietitian. I am driven to be the best health coach out there. Diabetes has helped me be in tune with my body, and understand the power of nutrition. It’s given me my drive, my empathy, my passion. This is a small list, but there is a positive having diabetes. Furthermore, I strive, and recommend others to have grace, build confidence in your choices, and to be in charge of your lifestyle. Doing so, you can put our best foot forward to feel your best, and have the best day of your ability, which plays into the best possible life. To get the ball rolling, we need to be motivated, and that can come from many different areas. Take a moment and ask yourself where you can get such inspiration. Maybe here on this website? This week, I picked up a new podcast, Colorful Eats, hosted by a fellow type 1, Caroline. In a recent episode, she really spelled out the meaning of giving grace. The definition is along the lines as a smooth and pleasing way of moving, or a polite and thoughtful way of behaving. Above all, give grace to what makes you happy and don’t judge setbacks. Move on, learn what you can and surround yourself with positive people you love. Mary Tyler Moore was more than just a beloved American role model, she really did turn the world on with her smile and has highlighted how tough and brave we are with diabetes. I just wrapped up a call with a client and she openly shared she had only consumed 4 ounces of water yesterday by dinner time. This quickly reminded me that we often overlook the importance of hydrating, and easily knock it off the priority list. But 4 ounces, that is wild, and so little. On average, I recommend about 75 ounces of water per day for my female clients (averaging 150 lbs), or a little shy of 10 cups. It’s a task, but well worth accomplishing. Why? improves digestion, however, I recommend drinking most of water outside of meal time. Building on the conversation of endurance, last week I did a hot yoga class at Blue Spot Yoga in Bexley, OH. Shout out to Staci McCool; she is one of a kind and born to be an instructor and leader. Yet as soon as I walked in the yoga room this one evening, I immediately regretted my efforts of hydrating early in the day, and honestly, the day before too. My dehydration can easily impair my performance and I generally appear to struggle during the class. I know I am not the best yogi on the block, but I am a better one when I drink enough water and fuel properly. As I laid on my mat before class, I thought of chugging the bottle next to me before I heard the words, “Let’s begin,” but, no, it would perhaps do more harm than good. What? Yes. Why?! Take it from me, do your homework and hydrate 24 hours leading up to an activity like hot yoga, and I’ll summarize some good nutrition advice for the practice soon, but reach for hydrating foods such as produce, soups and smoothies, minimize processed foods including grains not in their pure, whole form, making quinoa, wild rice, whole gluten free oats, millet, buckwheat groats our best options. For estimating water needs – take body weight in pounds and divide by 2. Going off the example above, a 150 lbs person would be 75 ounces of water minimum. This estimated water intake is to be exactly water. Coffee, sodas, even La Croix, tea do not count towards the tally. For exercise, to be exact, weigh in to assess hydration loss. Hydrate enough to get back to pre-exercise weight. If a scale is not handy, drink to comfort post workout and refresh with water during. Spring and mineral water are best, but you can spice things up by adding a few berries, cucumbers, or citrus (orange/lemon/lime) to your glass of water. Stay tuned for more fueling advice, and lastly, if you do hot yoga daily, consider hydrating with mother nature’s electrolyte beverage such as coconut water and while striving for a whole food clean diet, don’t shy away from sea salt (avoid table salt!). Listen to your body salt to your in-tune desire. In 2011 I was in an accident in Melbourne, Australia where I had to be taken under for a trauma surgery to my jaw. It may sound like blasphemy, but when I was in the OR bullpen (I am sure there is a more appropriate name! ), the anesthesiologist was kindly telling me what they were going to do, and kept asking if I could remove my insulin pump and the entire site (a band-aid like adhesive where a hairlike need is inserted into my skin so insulin could flow into my body). I obliged. I didn’t want to take it off because I knew for one, my backside is one of the best spots for my pump, and getting a good site that absorbs the insulin efficiently, for me then, was not a quick process. Above all, I was fasted for far too long, not thinking entirely clearly and was in severe pain despite the medication I was on and did not want to twist my body in the needed fashion to get a new site. Secondly, I assumed I had to manage to get a new site myself because this method of controlling my blood sugars was not common in Melbourne, a commonwealth country where the government funded the medical supplies. Thirdly, I didn’t see the need. He wanted to remove it to prevent a bed sore/bed wound, and I knew I was a healthy 20-something and the surgery was not anticipated to be an all-day event, or days event. So the anesthesiologist and I met in the middle. He took my pump, I left on my site. While my blood sugars were tested throughout the 4-hour surgery, and I am guessing the range was flexible, I did not have insulin administered at all during that time. I have a vague memory post-op, which was late in the evening, of my Certified Diabetes Educator running into my room asking for my glucose reading because the pump removal was against her orders. Sure enough, I was loaded with ketones, which thankfully recovered, but I could easily say, I was scared for my life. How could this top-level trauma hospital in all of the country, let alone state, miss this? No doubt the doctor did call me after I was discharged acknowledging the mistake. While this story has more details, and I will spare them, it is an example of a moment and not the only one in the decades I have had type 1 diabetes, that I felt alone, without a team that I fully trusted to care for me entirely. Where I am getting, and perhaps you can relate, I want to be your person, helping you on the journey of living with diabetes emotionally and therapeutically. It is far more than a game of counting carbs and drawing up a dose of insulin or medication or manipulating a diet to fit the need. If you are in need of building a team for your diabetes and the timing is right, let me be your coach. Don’t hesitate to ask, and I wish you the best health, today and the many tomorrows. If you didn’t catch my social media posts about an interview I had with Redbook Magazine, catch the details here. 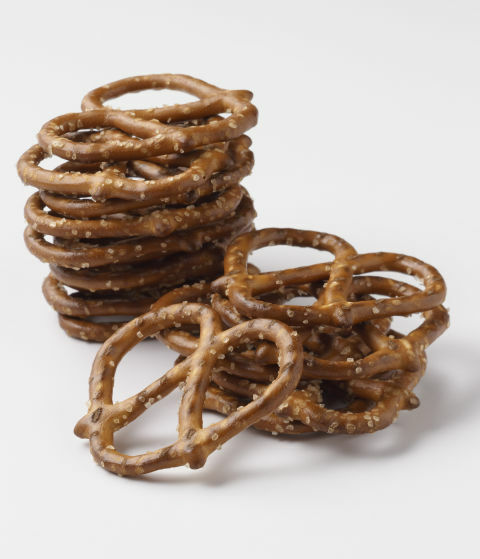 You know that all-too-familiar feeling: The one when you desperately need a snack, so you pour a quick bowl of whole-grain cereal or grab a bag of pre-portioned pretzels. Smart, right? Ehhh. It might make you even more hungry, unfortch. “When you eat processed carbs (anything made with refined grains, flour, or wheat), your blood sugar rises quickly because there’s little to no protein or fiber,” says Akilesh Palanisamy, M.D., an integrative medicine physician and author of The Paleovedic Diet. What’s worse: They could be sabotaging your weight loss goals, wreaking havoc all over your digestive system and making it virtually impossible to lower that number on the scale. So read on to learn more about the foods you thought were a wise choice—especially when you just need something other than kale—and what you can swap ’em out for instead. This new-to-the-scene snack food features all the buzzwords that make it sound like the ultimate healthy snack: It’s asuperfood! And gluten-free! There’s protein and fiber! The problem: They’re basically corn chips with a little quinoa thrown in, says Kelly Schmidt, R.D., a nutritionist and blogger at Paleo Infused Nutrition. And the quinoa itself has been so highly processed that it’s lost the nutritional boost that made it healthy in the first place. Need proof? Just compare the stats of one cup of cooked quinoa (8g protein, 5g fiber) to one serving of quinoa chips (1g protein, less than 1g fiber)—and then listen to your stomach make noise because it’s still going to be hungry. The better choice: Beyond nuts and seeds, there are plenty of ways to get that crunchy texture. Choose super-portable whole fruit like an apple or pear, or go for freeze-dried fruit—it has a sweeter, crispy taste and way less sugar than dried fruit, says Schmidt. 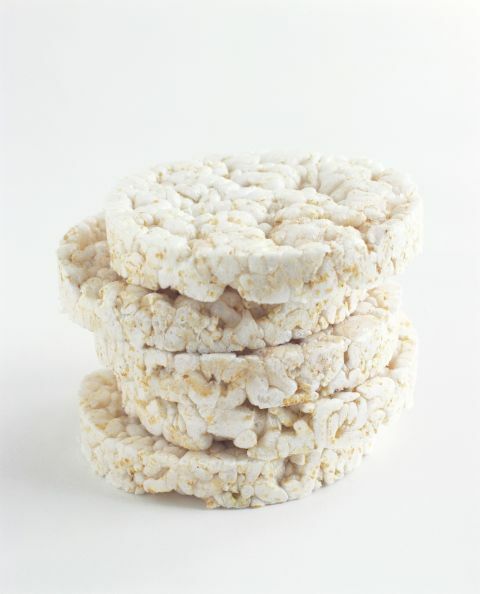 Bonus: They’re not super perishable, so they can be the go-to snack in your purse for a few days. Nutritionists always say popcorn is ahealthy snack, and it is, so long as it’s made right. “The microwaveable kind has cancer-causing chemicals in them,” explains Palanisamy. One is called PFOA, which the EPA says is likely a cancerous carcinogen that’s found in the plastic of the bag. 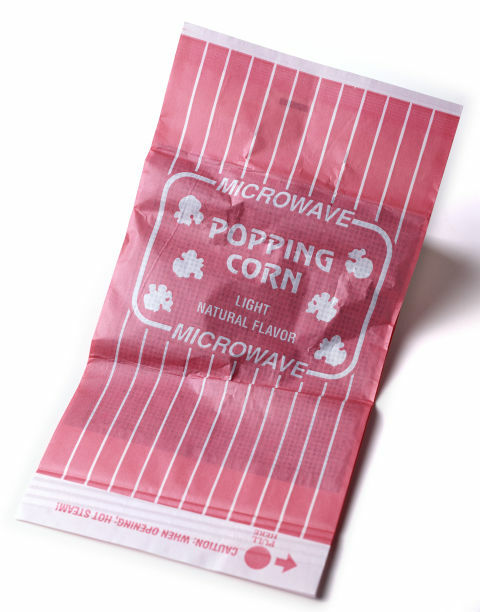 The other is in the butter flavor, and it’s known as diactyl, an organic compound that’s been linked with breathing issues and lung disease, thus making “popcorn lung” a real—and serious—health concern. The better choice: Still go for the fiber-filled popcorn, just DIY it on the stove (using heart-healthy olive oil) with an air popper like this one from Cuisinart. And don’t be afraid to play with flavors, asadding in spices like turmeric or cinnamon can kickstart your metabolism without adding calories. 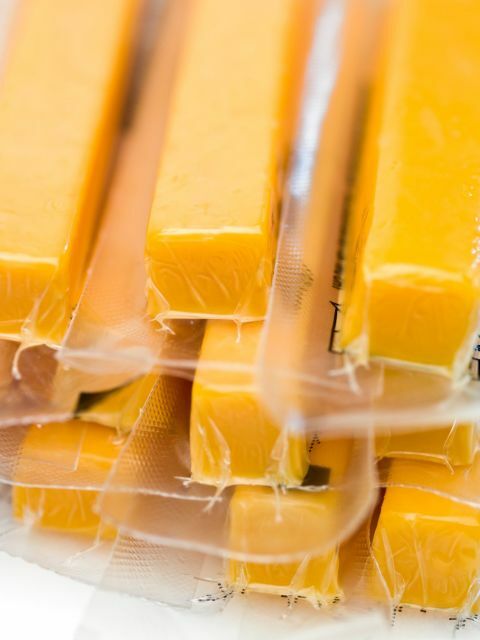 The obsession with low- and no-fat products we had in the ’90s still lingers, but reaching for them isn’t better than grabbing the full-fat kind. Researchers found that people who ate full-fat dairy tend to have lower body weight, less weight gain, and a lower risk of obesity compared to those who continued the fad. 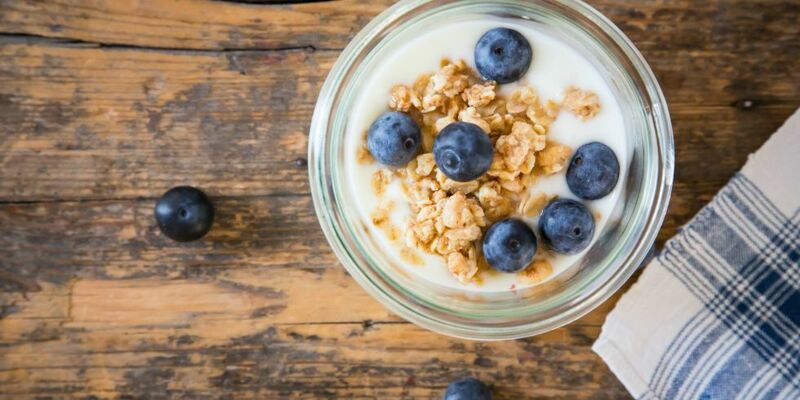 They think it’s likely because when you remove fat from dairy, you also strip away beneficial fatty acids that can help you feel full, so you end up eating more in the long run. Plus, a lot of people opt for flavored yogurt, which has tons of sugarthat, once again, put your blood sugar on a crazy roller coaster ride. The better choice: Go full-fat—and don’t feel one stitch of guilt about it. As for flavor, mixing in natural foods like fruit, honey, or coconut chips can take your spoonful in whichever direction you crave. These salty bites may sound like a smart snack since they’re lower in fat and calories than potato chips, but they actually won’t do your waistline any favors. “They don’t contain any nutrients,” says Palanisamy. “They’re basically all carbs and loaded with sodium,” so they’ll put your blood sugar on a roller coaster ride, spiking your levels sky-high only to make you hungry as soon as it drops back down. The better choice: Coconut chips, says Schmidt. Never heard of ’em? Get acquainted, as these babies are filled withhealthy fats to keep you full. And while they’re typically sweet, savory lovers can get in on the action now as brands likeDang Foods offer up flavors like bacon or chili lime. 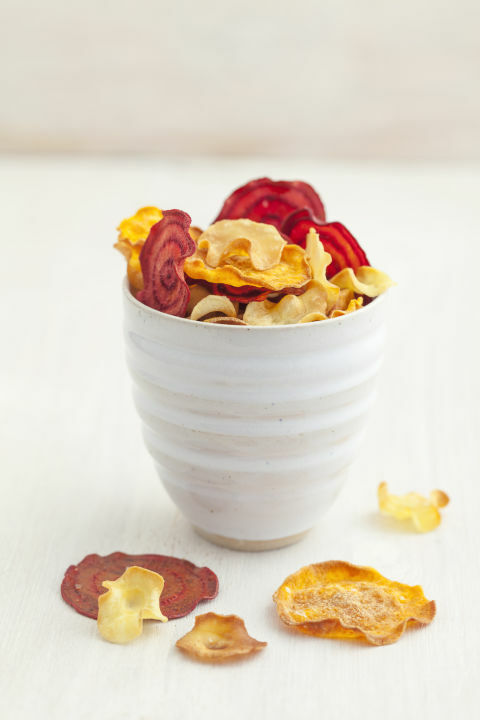 Chips made with sweet potato, beets, or parsnip—those ought to be healthy, what with vegetables being the primary ingredient and all. But Palanisamy says they’re pretty high in fat—around 9g per serving—and it’s not the good kind. The oils used range from canola to sunflower or safflower, all of which contain omega-6 fatty acids, which promote inflammationthat’s been linked with autoimmune diseases, heart disease, cancer, insulin resistance, and weight gain. Plus, the whole reason you’re eating them—because you want those good-for-you nutrients from the veggies—is a farce. 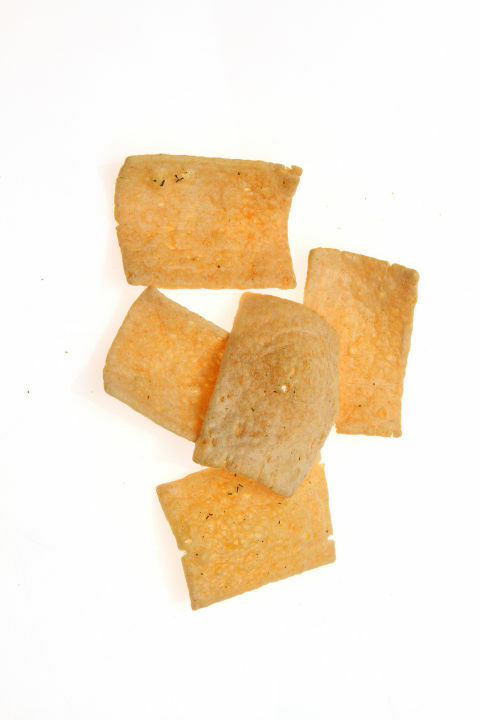 Palanisamy says the chips have been stripped of those benefits, and they provide no protein and little-to-no fiber. The better choice: If you’re craving the crunch, go for a handful of nuts (almond or macadamia) or seeds (sunflower or pumpkin) instead, says Palanisamy. Yes, they’re high in fat, but it’s the healthy omega-3 kind associated with heart health, lower risk of cancer, lower blood pressure, and reduced inflammation. These have the perpetual stigma of being a smart, low-cal “diet food,” and sure, they’re not the worst idea in the world. 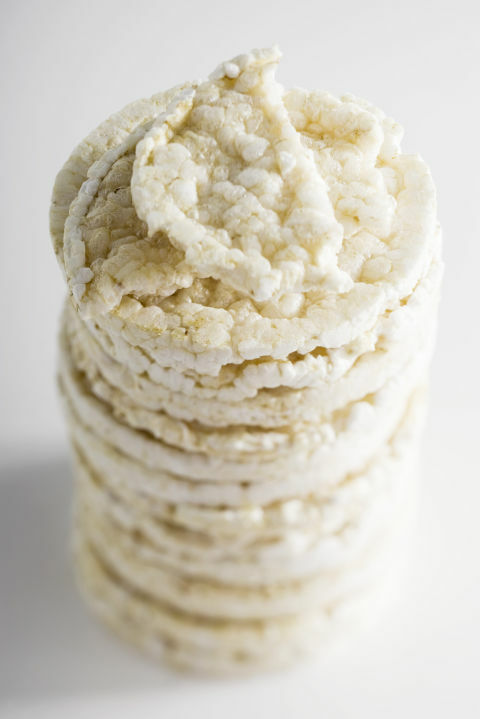 “Rice cakes can make a good snack for people who are transitioning toward agluten-free diet if it’s a smart health decision for them to do so,” says Schmidt. But since they’re high in carbs, they’re high on the glycemic index, and a recent study found a potential link between high-glycemic foods and lung cancer. Not to mention high-glycemic foods tend to cause your blood sugar to spike, then crash, which makes you hungry all over again shortly after you snack. The better choice: Top your rice cake with almond butter or mashed avocado to give it some staying power, suggests Schmidt. The spreads contain healthy fats and protein, which will keep you full longer and your blood sugar from rising too quickly. 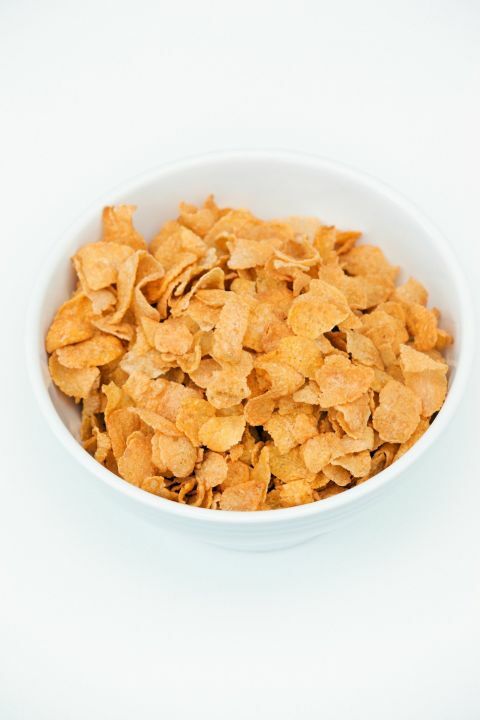 Truth: The breakfast staple usually plays a major role in taming mid-afternoon hunger because it’s fast, convenient, and you can eat it straight from the bag. But therein lies the danger—it’s super easy to eat a reasonable portion, and then some more, and more after that. Then you’ve blown over 200 calories on an unsatisfying snack, because most of the time it’s made from refined grains that aren’t rich in nutrients, says Palanisamy. Another problem: Boxes tout being “high in fiber,” but it’s usually insoluble fiber that’s been shown to cause irritation in the gut, bloating, and other GI issues, he adds. Healthier, soluble fiber is what you find in foods like barley or beans. The better choice: Make a bowl of plain oatmeal as it has the soluble fiber that can reduce your risk of heart disease and help food move along your GI tract (not to mention nix bloat and constipation), says Palanisamy. Ramp up the flavor—and score extra nutrients—by adding berries and chia seeds, which have a high level of omega-3s. Sadly, “popping” chips instead of baking or frying them doesn’t make much of a nutritional difference, says Palanisamy. Yes, they slash the fat content in half compared to regular potato chips, but they don’t offer any micronutrients, like vitamins and minerals, and their paltry fiber and protein quotas (1g of each)—not to mention calorie count—is comparable to what you find in a serving of the regular stuff. The better choice: First, figure out if you’re actually hungry. Schmidt says people often reach for processed snacks when it’s a craving, and not true hunger. Ask yourself, “Would I eat carrots or an apple right now?” If the answer is yes, trythese junk food swaps. If not, grab a glass of water instead. Seems like a genius idea: Grab a bag and you have a pre-portioned, calorie-conscious snack at your convenience for those times you’re craving dessert. But you’re better off grabbing a more caloric snack that has tons of nutrients to actually keep you full. “When you’re eating a small 100-calorie bag of cookies or crackers, you’re not really getting what you want,” says Schmidt. And that makes you much more likely to reach for another, and another, and another. The better choice: “If it’s not a whole food, it’s not worth your money,” says Schmidt. If dessert is what you’re after, try foods that are naturally sweet, like dates stuffed with peanut butter or any of these healthy options. I had a mug of broth this AM before breakfast, and it was honestly amazing. I can easily sense the passion and patience put into the broth sourced from Chicago Bone Broth. While (I think) I am pretty decent in the kitchen, my broth hasn’t ever been anything to write home about. The flavor I enjoyed this morning was the offered spicy broth – and it is not a cheap Franks Red Hot spicy, it drew me to believe specific herbs and vegetables were chosen, selectively to give the balanced and enjoyed flavor. And don’t get me wrong, I love me some Franks, just used in the right places; like chili! If you can’t tell, I am truly crushing on this healing food, and love supporting a local Chicago company. Head over to Chicago Bone Broth’s website to learn more, and if you want to have some of your own, plug in “paleoKelly” for a discount. They have various pickup locations in the city and feel good about your purchase as it also they are partnered w/ Inspiration Corp., whose mission is to help people improve their lives and increase self-sufficiency though social services, employment, placement and housing. February is all about the heart. From the Hallmark holiday of Valentine’s Day to advocacy and awareness of heart health. In relation to diabetes, heart health and the former share some common ground. For worse, one complication increases the risk of the other, yet, on the positive, these health conditions provide a push to take extra care of our health and food choices. In the least, here are some small steps that can aid big health results for blood sugar control and caring for our heart. Nurture sleep. Tis the secret sauce of our health. We should act like we are getting paid to sleep; because in the end, we really are regarding health. When we are sleep-deprived, we are not only sparking a cascade of events in hormonal imbalance, including insulin resistance, but we are also throwing our cravings for a loop. Even if you are not able to pack in the needed 8 hours of sleep by catering to a bedtime, etc., then strive for quality sleep. How? Make sure your room is cool (68F), pitch black, quiet and calm. Get blackout curtains if needed, use some ear plugs if you are a city slicker like myself and detox from electronics a good our before making it to your pillow. Lastly, look into trying a magnesium supplement. Every night I have a routine of sipping on some tea with some unflavored Natural Calm (a magnesium drink). Choose each meal based on a combinations of vegetables and some fruit. From there add in high quality protein. Indeed, make the target of vegetables 2 cups per meal and select of variety of color. Does this recommendation sound familiar? It not only stems from my philosophy of eating more real food, but rides on the recommendations of one of the top-rated diets in the last 6 years, the DASH diet. Measure your current weight, and then take that number and divide it in half. The number you get is the value of ounces you should drink within a day. And sorry, the liquids from coffee/tea do not go into this estimation. Find a good water bottle and take it along with you EVERYWHERE. Get up every 60 minutes. Sitting in the modern cigarette. It’s hurting our health on a daily basis. If you follow the tip to drink more, you very much so will be getting up to use the loo more. Either way, cardiovascular health isn’t about hitting it hard in the gym, although that can be a plus if monitored in a healthy dose, but just moving more each hour of the day can please your body, improve blood sugar control, production and more. Lastly, it’s not only about what we feed ourselves with food, but it’s also about what we feed our mind. Pay attention to how you talk yourself, and if the tone can be more gentle or nicer, start changing your thoughts. Be kind, supportive and reassuring.